The Science of Team Science conference in Chicago is on bringing new knowledge and new questions about how researchers can work together to address some of the wicked problems faced by society today. 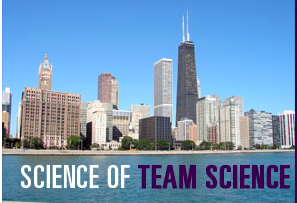 For the last two days I’ve been attending the Science of Team Science conference at Northwestern University in Chicago. It is what I can only imagine is the closest thing to the Super Bowl or World Cup of team science (minus the colourful jerseys, rampant commercialism, and hooligans — although that would have made quite an impact as academic conferences go). The presentations over the first day and a half have illustrated how far we have come in just a few years. In 2008 a similar conference was held near the NIH campus in Bethesda, MD. That event, sponsored by the US National Cancer Institute, was an attempt to raise the profile of team science by highlighting the theories and rationale underlying why the idea of collaboration, networks and multi-investigator applied research might be a good idea. The conference was aimed at sparking interest in the phenomenon of collaborative team research for health and resulted in a special issue of the American Journal of Preventive Medicine highlighting some of the central ideas. Although there are many of the same people attending this conference as there was two years ago, the content and tenor of the conversation is markedly different. The biggest difference is that the idea of team science no longer needs to be sold (at least, to the audience in the room). There is wide agreement by attendees that team science is a good thing for a certain set of problems (particularly wicked ones) and that it will not replace normal science, rather complement it or fill in gaps that standard research models leave. There is also much contention. Although, unlike other conferences, this contention is less about a clash between established bodies of knowledge, rather it is based on uncertainty over the direction that team science is going and the best routes to get there, wherever “there” is. Stephanie Jo Kent, a communications researcher from UMass, has been live blogging at the event (and encouraging the audience to join in — follow #teamsci10 on Twitter or Stephanie @stephjoke) and wrote a thoughtful summary of the first day on her blog. Here she points to one of the biggest challenges that the emergent field of team science and the conference attendees will need to address: Getting beyond “the what” of team science. Because everyone has their own thing that they’re into, whether its research or administration or whatever, we would have to come up with “a meta-thing” as a goal or aim that everyone – or at least a solid cadre of us – could get behind. What if we decided to answer the process question? Instead of focusing on, “What is ‘the what’ of team science?” which takes as its mission connecting the science; we propose an examination of self-reflective case studies in order to identify “what works” and thus be able to explain and train people in the skills and techniques of effective team science. This issue of training is an important one. My own research with the Research on Academic Research (RoAR) project has found that many scientists working in team science settings don’t know how to do it when they start out. We scientists are rarely trained in collaboration and teamwork, and those that are, are not in science. It will be interesting to see where things go from here. I suggest following us all on Twitter to see.